Carmina Baby Blue, Starchild soft leather baby shoes. Carmina flowers in candy baby pink and lime on baby blue shoes. Petals In Baby Pink And White, Starchild soft leather baby shoes, Petals baby pink and white flowers on baby pink leather shoes. 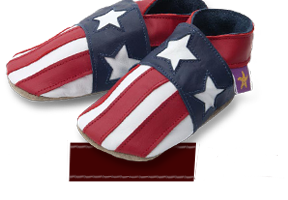 Stars In White And Taupe, Unisex starchild soft leather baby shoes. Stars in taupe on white leather shoes. Queenie White And Baby Pink, Starchild soft leather baby shoes, Queenie Queen of hearts triple hearts in baby pink on white shoes. Lovehearts Taupe And Baby Pink, Starchild soft leather baby shoes, Lovehearts in baby pink on taupe leather shoes. Retro Chocolate And Taupe, Starchild soft leather baby shoes, Retro trainers in chocolate and taupe leather.